Dr Janel has been practicing functional digestive medicine for over 20 years. She found her way to naturopathy indirectly. During her pre-med studies for conventional medical school, she began having severe abdominal pain. After exhausting all conventional treatment options without relief, her search lead her to an ND who helped her immediately with diet changes and digestive support. She was so impressed by this that she redirected her studies to attend Naturopathic Medical School at Bastyr University in 1994. She served a six year term as a resident and then associate in Pediatric and Family Medicine with Mary Bove ND. Since then, Dr Janel has continued to specialize in Digestive Medicine and Allergy Desensitization. With her extensive experience treating IBS/SIBO and the discomfort of chronic abdominal pain, gas, bloating, diarrhea, constipation and reflux, Dr Janel is really one of the integrative leaders in this field. She believes in a gentle, regenerative approach to symptoms if IBS, IBD, SIBO, GERD and other digestive disorders and has formulated her own supplement line, GI Janel to most successfully help her patients locally and around the country resolve their digestive symptoms. Since her treatments have been so successful with patients who have struggled for years trying to seek some relief, she is currently writing her first book on how to permanently resolve these digestive disorders and is excited about sharing how easily and naturally they may be resolved. Diet is a key factor for the resolution of digestive symptoms. But Dr Janel and her clinic team do not expect you to use difficult diets long term. Instead, they identify problem foods and desensitize the system so that the foods can be eaten freely again. Dr Janel has studied various immunotherapies and has the greatest successes with Low Dose Immunotherapy (LDA) for Environmental Allergies, Chemical Sensitivities, Digestive Disorders, Food Allergies/Intolerances and their related symptoms. Dr Janel has been using this immunotherapy since 2004 and has trained both MDs and NDs in this procedure. 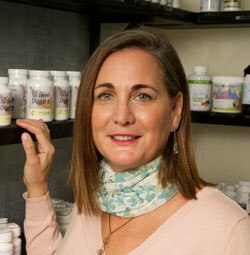 Dr Janel has been published in many articles and texts on Natural and Integrative Medicine. She is a professional member of the American Association of Naturopathic Physicians (AANP), the Washington Association of Naturopathic Physicians (WANP) and Natural Doctors International (NDI).